Pursuit Hunting: Was it Deer or Turkey? This afternoon while I was scouting for tomorrow's opening of muzzle loader season, I came across this area of freshly churned up leaves. If you hunt in an area with lots of turkeys, it can often be difficult to distinguish between deer sign and turkey sign if you don't know what to look for. Here are a couple tips to help you avoid hanging your deer stand over a bunch of turkey scratchings. If the leaves are broken up, chances are that the sign was produced as deer walked around feeding on acorns or other mast. Their weight and their small hard hooves break up the leaves pretty quickly. Notice that the leaves are pretty much intact. Of course, the best indicator of what was there is to look for what they left behind. If you are not familiar with what deer droppings look like, there are pictures here and here to get you started. Here is an example of what turkey droppings look like. I've heard them described as looking something like popcorn. Unfortunately, the spot I found in the picture above turned out to be turkey sign. I made a mental note for next spring and kept on scouting. 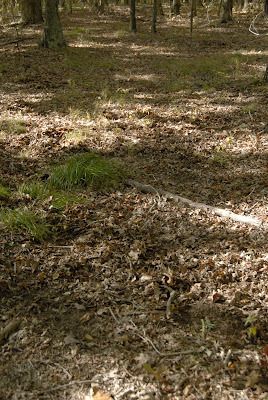 Interesting - I have been hunting an area that is all torn up, and I'm *still* not 100% sure if it's turkey or deer. I think it's actually both, since when I walked out there Tuesday afternoon, I got surrounded by about 10 turkeys, but then this morning when I was sitting up in my climber, I watched a button buck milling around that area for at least an hour. Are the turkeys maybe looking for bugs that feed on the acorns or something?